So right off the bat I will say this isn't a free pattern. It is a link to a free pattern from another blog. 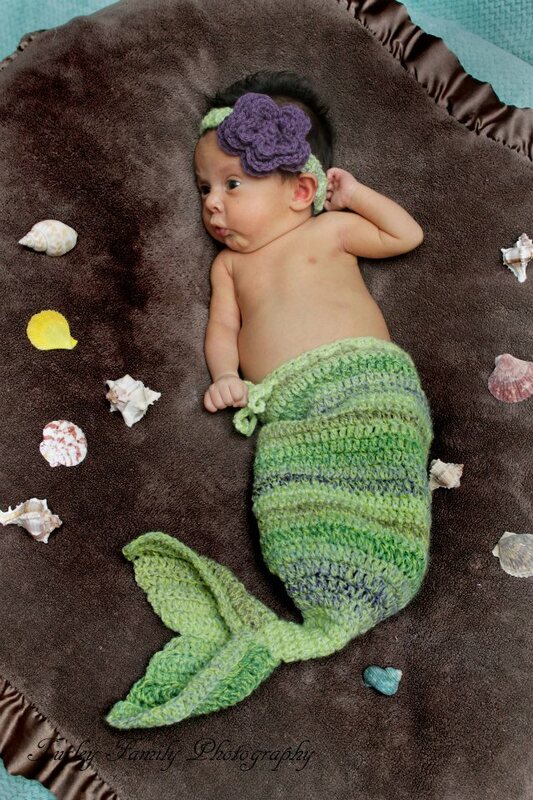 I did alter it quite a bit however to fit a newborn baby. I had gotten a custom order for one of these and I was actually very intimidated. However, it was really VERY easy when I got going on it, and can't wait to make another one! I added a headband that I just eyeballed at the time. The band is 13" around. 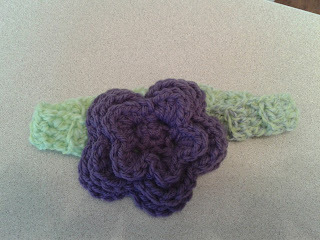 All it is is just 3 DC across, kind of like a tiny tiny scarf. The tail was the trickiest part. 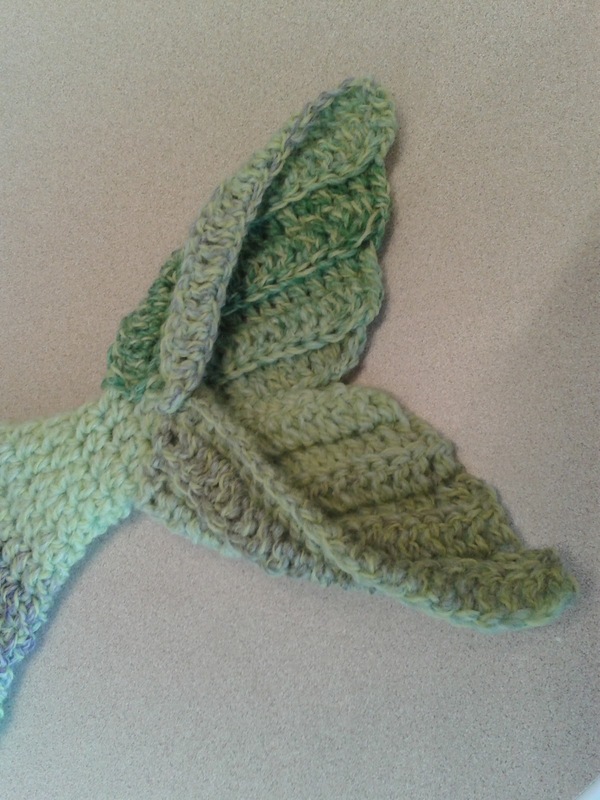 You make it in two parts then sew them together then onto the tip of the mermaid tail. I love the yarn I used, but unfortunately I have thrown the package out. I'm going to go back to the store to find out what it is and I will let you all know. 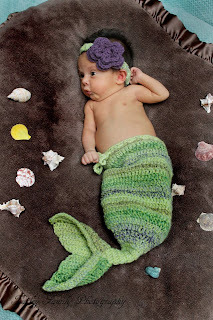 I even made the little seashell top, however, the client's baby was preemie so it was just WAY too big for the little princess. There you have it. The little mermaid costume! LOVE IT! I don't have the pattern written down but I could make you a hat. I ship for free anywhere in Canada, and depending on where you are I could ship to you for a very small cost. The hat would be $25. Thanks for writing! 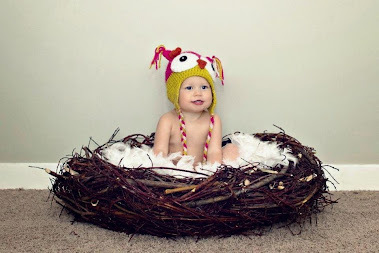 This is so adorable! I love the fin detail in your pattern. Any chance you'll write the pattern down someday? I didn't write the pattern down, but it is linked to the free pattern that I found online,(at the top, first sentence) and yes, the fin detail is there too. It is so cute isn't it. All I did was had the baby measured and only made it as long and tall as I needed to as her pattern was for a larger child. you start at the bottom so this is easy to do. Just stop increasing when you get to the desired size. I also put in a drawstring incase it was a bit too big. Good luck. this pattern and blog have been removed...anyone know why or where it moved to??? no I will try to find it though....so sad. 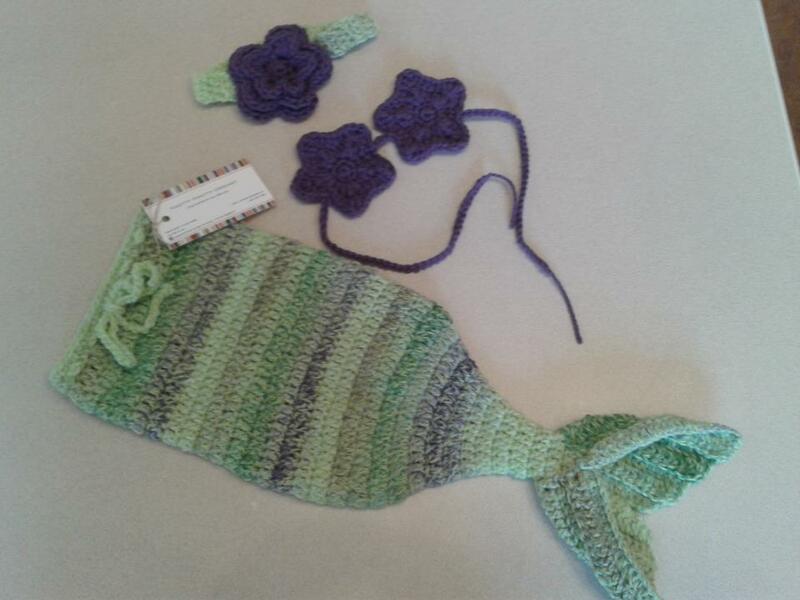 http://wichecraft.blogspot.ca/2012/04/mermaid-costume-pattern.html?m=1 seems to be the new home for this pattern. Did you ever figure out what yarn you used? It is perfect and I'd love to find it!